May 28, 2010 - The National Transportation Safety Board has issued a Safety Alert to advise parents of the dangers to young children on aircraft when not restrained in an approved child restraint system or device. The Safety Alert notes that preventable injuries and deaths have occurred in children younger than 2 years who were unrestrained. Specific child passenger safety issues on aircraft include the likelihood that parents and caregivers may not be able to maintain a secure hold on a lap-held child during turbulence and survivable accidents. Additionally, unrestrained children have become separated from their parents during survivable crashes and parents were unable to locate them during the evacuation. "As the summer travel season gets underway, the NTSB would like to remind families traveling with children that child restraints are the best way to keep youngsters safe - whether traveling by car or air," said NTSB Chairman Deborah A.P. Hersman. "While the NTSB would still like to see a federal regulation requiring the use of child restraints on aircraft, we continue to recommend that, when traveling by air, all parents purchase an airline ticket for every child in the family and place each child in a size-appropriate restraint system to ensure that everyone travels safely." On September 6, 1992, about 1802 central daylight time, a Piper PA-30, N7065Y, operating under the provisions of 14 CFR Part 91, entered an uncontrolled descent and crashed at Broussard, Louisiana. Parts of both wings and both horizontal stabilator separated before the airplane struck the ground. The flight, which was en route from Slidell, Louisiana, to Killeen, Texas, carried two adults and two children. The adult male who occupied the right front seat sustained fatal injuries. Although the impact involved high vertical and side loads, the adult male who occupied the left front seat, and a 4-year-old boy and a 10-month-old girl who occupied the rear bench seat in child restraint systems (CRSs) survived the accident with serious injuries. The occupant in the left front seat sustained a fracture of the thoracic spine, a ruptured spleen, liver laceration, and a pneumothorax. The 4-yearold boy sustained a closed head injury, a basilar skull fracture on the right side, and fractures of the right ulna, radius, and fibula. The 10-month-old girl sustained a closed head injury. The National Transportation Safety Board determined that the children survived because they occupied CRSs. Rather than being restrained by an adult-size safety belt, the 10-month-old girl's CRS provided upper body restraint and the 4-year-old boy's mini-shield child safety booster seat (with a crotch strap) provided him extra protection. Although the forces imposed on the individuals at impact could not be determined, the Safety Board believes that the type of injuries sustained suggest that the children and other occupants experienced between 20 and 40 Gs during the impact sequence. The aft bench seat was attached to the wing spar, which had separated and buckled inward beneath the bench seat and directly under the 10-month-old girl's CRS. Damage to the base of the CRS corresponded with damage to the spar. The Safety Board believes that the use of CRSs protected both children from the energy transmitted through the wing spar during the impact sequence. A previous general aviation accident also demonstrates the benefit of using CRSs. On August 21, 1988, a Beechcraft A36TC crashed during a forced landing east of the Paradise, California, airport. The airplane crashed at the bottom of a canyon on a 60 degree slope just short of a sandy beach. Both front seat occupants sustained serious back and head injuries. The rear seats were configured in club seating. Two adults were seated in aft facing seats. One sustained serious back injuries and the other sustained fractured ribs. Two children (a 2-year-old child and a 6-month-old child) were restrained in CRSs on the forward-facing seats in the aft row and were not injured. The Safety Board has also investigated accidents involving general aviation airplanes in which children were held on an adult?s lap and restrained by the adults? safety belt. This action contributed to or caused fatal injuries to the children. On December 25, 1991, a Beechcraft A36 crashed in a rural area of Wilmington, Ohio, and the airplane was destroyed. The two pilots and one passenger were fatally injured, and two passengers sustained serious injuries. One of the surviving passengers was seated in the left rear seat and was holding her 17-month-old daughter on her lap. Both were restrained by a single safety belt. The mother survived, and her daughter died of safety belt-induced internal injuries and crushing to the base of the skull. On April 11, 1987, a Cessna 172N stalled after takeoff at Ferguson Township, Pennsylvania, and struck the ground in a nose low attitude. The two front seat occupants were fatally injured. The occupant space at the rear seat remained relatively intact; however, an adult passenger and her 3-year-old son sustained fatal injuries. The adult died from blunt force head injuries. The 3- year-old, who was seated on his mother?s lap and was sharing her safety belt, sustained a crushed skull and serious internal injuries caused by the safety belt. Both children?s injuries were likely exacerbated by the weight of the adult on whose lap the child was riding. The adult?s weight has been shown to be the cause of injury in many automobile accidents in which a child is seated on an adult?s lap. The Safety Board believes that these adults may have erroneously thought that they were providing protection to the children by restraining them within their own safety belts. Neither the Cessna 172 nor the Beechcraft A36 Pilot Operating Handbooks cautioned against the use of one safety belt by two people. The Safety Board continues to be concerned that the Federal Aviation Administration (FAA) has not required children who have not reached their second birthday to be adequately restrained during takeoff, landing, and turbulent conditions, as required for all other aircraft occupants. Thus, small children are allowed to be held on the lap of an adult or be restrained by a safety belt during flights conducted under 14 CFR Parts 91, 121, and 135. On May 30, 1990, the Safety Board recommended that the FAA amend 14 CFR Parts 91, 121, and 135 to require that infants and small children be restrained in FAA-approved child restraint systems that are appropriate for their height and weight. On September 8, 1992, the FAA issued a final rule that amended 14 CFR 91.107, 121.311, 125.211, and 135.128 to require that operators permit the use of child restraint systems that have been approved by the FAA or foreign regulatory agencies. On March 5, 1993, the Safety Board responded to the FAA that this action was not acceptable because it did not require all occupants to be restrained. A companion recommendation, Safety Recommendation, asked the FAA to conduct research to determine the adequacy of aircraft safety belts to restrain children who are too large to use an FAA approved CRS and to develop some suitable means of providing adequate restraints for such children. On June 7, 1991, the FAA responded that "previous studies concluded that an adult lap belt is adequate for a child close to 1 year of age, provided that child has attained muscular and skeletal development and weight distribution (i.e. , no longer 'top heavy') to enable himlher to walk. On May 8, 1992, the Safety Board restated its concern about the ability of adult safety belts to safely restrain small children and urged the FAA to reconsider the recommendation. The Safety Board believes that the FAA should ensure that pilots know the danger of two persons using a safety belt designed for one occupant and the benefit of using CRSs. 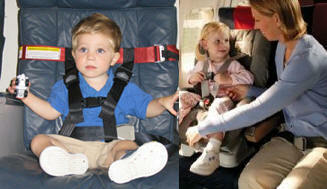 Further, the FAA should amend 14 CFR 91.107 to prohibit the use of a safety belt by more than one person. The Safety Board believes that the current regulations (CFR 121.311) which prohibit the use of a safety belt by more than one person who has reached his second birthday" should be amended to prohibit using a safety belt designed for one occupant by more than one person of any age. Although a mini-shield booster seat was successfully used in the accident in Broussard, Louisiana, the Safety Board is concerned about the level of protection provided by these seats. On February 22, 1991, the Safety Board expressed concern to the National Highway Traffic Safety Administration (NHSTA) about the use of mini-shield booster seats with lapbelts in automobiles, and recommended that the National Highway Traffic Safety Administration revise Federal Motor Vehicle Safety Standard (FMVSS) 213, Child Seating Systems to include performance standards for mini-shield booster seats (Safety Recommendation H-91-2). Because child restraint systems certified to FMVSS 213 and manufactured after February 26, 1985, are certified for use in aircraft, mini-shield booster seats are currently considered acceptable for aircraft use. Because of the potential for use on aircraft, the Safety Board is pleased that the FAA is researching the compatibility of airplane seat belts and child restraint systems, including minishield booster seats, at its Civil Aeromedical Institute. The research is examining the characteristics of several types of CRSs during tests in which air carrier seats are subjected to dynamic loads of 16 Gs. The Safety Board endorses this research because the results may provide the FAA with data that can lead to guidance on the appropriateness of using booster seats in air carrier and general aviation aircraft. In view of the information learned in these accident investigations, the Safety Board reiterates its earlier recommendation that the FAA: Revise 14 CFR Parts 91, 121, and 135 to require that all occupants be restrained during takeoff, landing, and turbulent conditions, and that all infants and small children below the weight of 40 pounds and under the height of 40 inches be restrained in an approved child restraint system appropriate to their height and weight. The Federal Aviation Administration also, the National Transportation Safety Board recommends that Amend 14 CFR Parts 91, 121, and 135 to prohibit two or more persons from using a safety belt that is designed for one person, regardless of age. (Class 11, Priority Action) (A-93-106) Begin an education campaign to inform general aviation pilots of the benefits of using child restraint systems, and the danger associated with using a safety belt designed for one occupant to restrain two persons. Also as a result of its investigation, the Safety Board has issued Safety Recommendation A-93-108 to the General Aviation Manufacturers Association and Safety recommendation A-93-109 to the Aircraft Owners and Pilots Association.